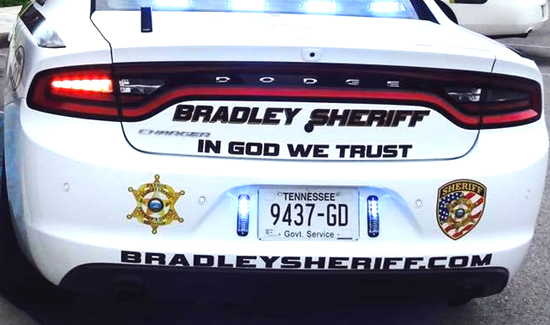 Bradley County Sheriff Eric Watson was booked at the Bradley County Jail Friday morning. He faces six separate charges of altering/falsifying/forging a title plate assignment. Sheriff Watson, a former state legislator, posted a $30,000 bond. He issued this statement, “For more than a year, I have confronted numerous accusations from some who desire to have more control over county government and the operations of the Sheriff’s Office. I have cooperated with the Tennessee Bureau of Investigations and responded to anyone who has requested information from me which related to the questions which have arisen. “To my knowledge, I have not been questioned about the accusations which are contained in an indictment which I have not seen. Evidence was presented to a grand jury on Wednesday after a year-long investigation by Sevier County District Attorney James Dunn and the TBI. The probe began after allegations were made by Bradley County Commissioner Dan Rawls. Commissioner Rawls said in June 2016 that he had turned over to authorities what he said are multiple instances of alleged illegal conduct by Sheriff Watson. He said he gave the evidence to District Attorney Steve Crump, the TBI and the FBI. DA Crump later left the case because of a conflict of interest. Commissioner Rawls said, “And there is still more there. The more you uncover the more you become appalled.” He said some of the allegations include the disposition of a sheriff’s van, the activity of his wife, Tenille, as a bonding agent, the sheriff’s alleged involvement with a woman who has had several arrests, and alleged threats toward him made by the sheriff. Commissioner Rawls said he began to become suspicious after examining some transactions in the sheriff’s department that came before the commission finance committee. He said the van that was sold was purchased in excess of $130,000. He said various high-tech equipment was added to it. He said it was sold for $20,000 to a bounty hunter in Nashville identified as a friend of the sheriff’s.